Everything started about five years ago, when a patient came to my office in Guadalajara, Mexico with a severe knee pain. She was overweight, which made the problem even worse. Her pain would not let her stand for a long period of time, in her hard work of selling orange juice and peanuts in the street, to be able to feed her family. I treated her with anti-inflammatory medicine and analgesics, hoping her pain would diminish. I knew very well though, her relief would be temporary, since her real problem was a bilateral degenerative osteoarthrosis. A few days later she came back without feeling any better, I told her that her situation could be solved only with surgery. That advice was all I could do for her, since it was not of my field of expertise. But I could feel her pain and frustration for not having the means to see a specialist, so I tried to find an alternative for her. I promised her I would do something about it. Searching the internet for “knee pain,” among other phrases, I found a word that was totally unknown to me: Prolotherapy. It sounded amazing, but too good to be true. Nevertheless, it seemed this could very well help my patient. During the following three months I downloaded hundreds of articles, and the more I read, the more my eagerness would grow. There was the name of a doctor mentioned continuously: Dr. Ross Hauser. Upon contacting Dr. Hauser, he forwarded me to the Hackett- Hemwall Foundation (HHF) to learn Prolotherapy. This is where the best adventure of my professional life started. I decided to pull all my efforts and risk all the financial resources I had (even a friend of mine lent me some money) to attend the training course, but it was still not enough to cover my expenses. Nevertheless, I met Jeff Patterson, MD and Mary Doherty’s kindness and generosity, that even without knowing me, they allowed me to attend to my first Prolotherapy conference at the University of Wisconsin in Madison, covering only one part of the fee. Mary Doherty, Dr. David De La Mora and Dr. Jeff Patterson. My name is David De La Mora, I’m a Doctor (MD) from Guadalajara Jalisco, México. Since long time, I’ve been interested in Prolotherapy as the best way to relieve patient’s joints pain. I wrote to Dr. Hauser to ask for information of how and where to learn about this method. That’s how I learned of you and the Hackett Hemwall Foundation’s annual seminar you organize. I would like to share with you my emotions when I found out about this technique which helps to avoid more damage with major invasive treatments to the patients. I’ve been working actively with the Sociedad Médica Cristiana de Guadalajara (Christian Medical Society of Guadalajara) for seven years along with some other doctors and missionary people reaching the communities in our country that are in need. We bring them food, clothing, medicine and give medical attention, all for free. I seriously believe that this awesome technique of Prolotherapy will bring a great benefit for them and also for my patients in my private practice. I would very much like to attend the next seminar and learn the basic Prolotherapy techniques, but I have a special personal request. If it would be possible for me to pay the Residents Fee so I can pay the hotel and the round trip by bus from Guadalajara to Chicago, and then to Madison, Wisconsin (some thousand miles). Sorry for asking you this, but the economic situation is not the best. If this is not possible, I’ll understand and somehow I will manage to be there. I’ll be looking forward to hearing from you in not too distant future to fill my registration form. Although I cannot imagine riding by bus from Guadalajara to Madison, we will be delighted to have you at our conference. I will work on finding you free housing so don’t worry about that part. The resident’s fee will be fine if you are able to pay it. If not let me know and we’ll work out a more generous discount for you. I am copying this to Dr. Janes, who is my Spanish speaking Mexican Prolotherapy Ambassador. We are interested in considering Prolotherapy training in Mexico as well. This is how I was able to attend to my first conference, in which I was able to realize that Prolotherapy was not fiction, to find the project of my life that I had been looking for, and to find the solution that my people in Mexico needed so urgently. I had hoped to further my learning and emailed Dr. Ross Hauser who let me participate in his very last Prolotherapy mission in a Church in Thebes, Illinois. The humanitarian project was called “Beulah Land” and ran for 11 years. I learned from Ross, among other things, to pray for each patient in loud voice (which I still continue doing it in my private practice today). The next year, I was able to go to Honduras with HHF… and WOW! These experiences were so thrilling, and made me wish that this could also happen in Mexico. I talked about it with Dr. Jeff Patterson, and he expressed his excitement about it too. He later talked to the board of directors and their affirmative answer came soon afterward. Trying to find the best place to carry out this brigade, I talked to my church leaders to ask permission to use their facilities. They accepted, without skepticism. I was able to gather a group of friends that embraced my vision, and thanks to them and to the support of the members of the church, we had our first HHF Prolotherapy mission in Mexico. The church turned into a hospital, with 17 doctor’s offices installed in the Sunday school classrooms, where about a thousand patients were able to be seen during five days. “This has been one of the most gratifying experiences of my life. It didn’t stop me thinking how exhausting it could have been, or having to cancel some of my personal activities. That joy that comes from helping my neighbor in his pain, and to be able to see how that kind of help can change somebody else’s life is something that cannot be found anywhere else” That is how Sergio Gonzalez was able to brief his experience in his first brigade, where he was the one responsible for the “circulantes” (helpers), a group of enthusiastic youngsters that would carry out all kinds of jobs, from answering questions to carrying sick people that were not able to walk by themselves. The day the brigade was over, Sergio himself, became a patient to ease an old pain that came up again caused by the extra effort of the week. As a helper and a patient, Sergio was able to receive a two sided blessing from this brigade and of course, he repeated the “dosage” the following year. Dr. Merel Janes showing Dr. Bonilla the direction of the needle. The total success of this first brigade placed solid foundation to continue year after year with this noble effort to help those in great need. 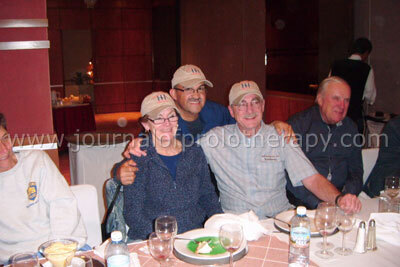 Last January, we carried out our third Prolotherapy and vein mission in Guadalajara, Mexico, and we are getting ready for 2011. Dr. Brian McDonagh, Dr Kamran, Dr. Helen David injecting a patient. We have taken care of more than 2,500 patients during these three missions. The team of foreign doctors, including helpers and nurses, is close to 35 people, and the local team for helpers, translators and people in charge of organizing the whole event is about 80 people. This adds up to 120 people (including my wife Martha and my children David and Haniel), which allowed us to be able to treat patients with excellence. From the beginning of the project, we have also counted on the cooperation of a very well known group of doctors specializing in veins, directed by Dr. Rick Owens, who has strongly enriched our humanitarian service. They bring along their own ultrasound devices, with which they are able to have a very precise diagnosis, and work exactly where the vein is damaged. 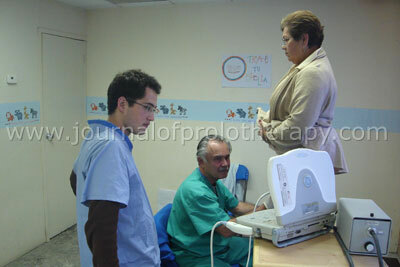 Dr. Gary Clark and translator David De La Mora doing ultrasound on a patient. In the year before mission, Dr. Black performed obliterations of veins with laser to 33 patients, he took care of ulcers of significant size and terrible varicose veins were able to be healed with his treatments. He is only an example of all the doctors with a highly human quality that come to our country to pour their talents in an unselfish way, leaving behind their personal work for a week and not only that but paying their own travel and lodging expenses, just for the sake of helping others. Mexico is really blessed by them. With the same spirit of doctors George Hackett and Gus Hemwall, Dr. Jeff Patterson has continued with the humanitarian labor of the Hackett-Hemwall Foundation since 1968 without pursuing any benefit other than just help others. Dr. Patterson is also professor for the family practice department of Medical School and Public Health for the University of Wisconsin. His priority, as well as the one of his mentors, continues to be to “teach anyone anywhere” the Prolotherapy technique. And of course, I can’t miss mentioning his partner Mary Doherty; her important work for the organization and administration within the foundation has been crucial for the missions to take place in Honduras, Mexico and the rest of the world. In Mexico, the first meeting with the Board of Directors was at the Medical School for Universidad de Guadalajara, where Dr. Patterson gave a lecture about this procedure. University of Guadalajara and University of Wisconsin signed a “memorandum of understating” and there is hope to continue working toward having Prolotherapy taught in the University centers of this country. Dr. Jeff Patterson, Dr. David De La Mora and Dr. Andrew Kochan examining a patient. The results of the Prolotherapy and vein missions have been so beneficial that they are now eagerly anticipated every year by patients, doctors and all the whole team that make them possible. The benefits of Prolotherapy have extended from the people in Guadalajara to other states of our country. Many people have benefited from only one treatment, putting an end to long periods of suffering pain. Such is the case of Fernando Fernandez who, after suffering a knee injury which caused him to limp, was treated during the first brigade and now reports being able to play soccer again. He is now an advocate for Prolotherapy. Most of the patients treated with Prolotherapy in the first two brigades have come back for medical attention… Only this time, it is for a different joint, because the one treated previously is totally healed! Helpers receiving the patients with love. Another important benefit of the mission is the teaching for foreign and local doctors, who during that week receive an important spring of experience working shoulder to shoulder with the best experts in this technique. During this last brigade the seed was planted in more Mexican doctors (every year the number increases) and they will take to their own towns the fruit of Prolotherapy. Dr. David De La Mora, Martha, his wife, and Dr. Andrew Kochan. I enjoyed making a contribution to your people, and I enjoyed meeting the men, women and children of your church. Overall, I had a good time meeting your staff, the patients and the other doctors and helpers who also came to volunteer their time and skills. They were wonderful people. I was impressed with the quality of your congregation, especially the young adults because of their friendliness and their happy attitude to life. I suspect this is because of their involvement in your church. In addition, they were excellent translators and they were fun to have around us. I look forward to returning again next year to support your charitable work. Thank you so much for all of your help and work. Most of all for your friendship. Mary and I feel so lucky to be working with you. What a wonderful thing you are doing. I believe it will continue to grow and produce great things. Guadalajara has very nice and warm weather, even during winter. So doctors who come from cold countries, find it a very nice work environment. 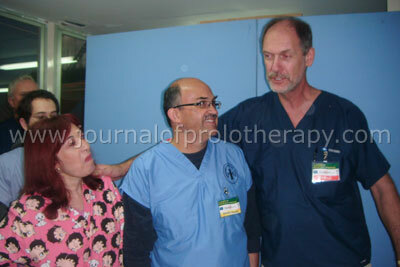 Prolotherapy in Mexico is growing. Seeds were planted. Five years ago, this technique was practically unknown in the country, and now the interest in it is growing within the medical community, and through the testimonials expressed from one satisfied patient to another. These things make it possible that a bigger number of people will look for this option to relieve their pain. So, what happened to the woman with knee pain from the beginning of the story? I treated her with Prolotherapy and…voila! She was totally healed and able to continue her life and work without any pain. This is the reason why I have come to conclude that Prolotherapy is… more than a medicine…It is hope.